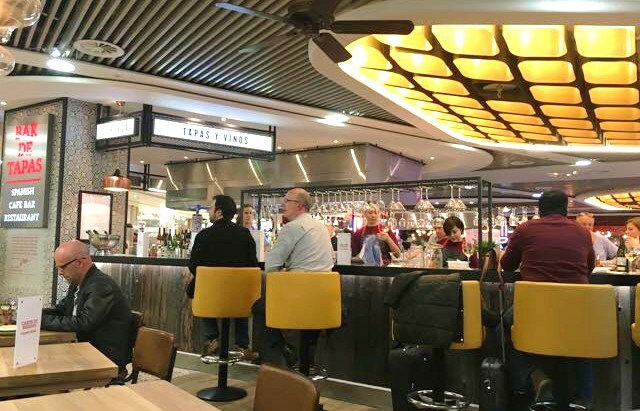 Now Grand Central shopping centre has opened there’s a host of new eating possibilities to try out in the city. The transformation at New Street Station has provided the airy light space for more than a dozen venues, and we’ve tried a couple already. We’ve seen people complaining that there are few independents in the “food court”. Firstly I put it in inverted commas because it’s not your standard food court: if you want McD’s or BK you’ll have to go somewhere else. Secondly, there are a few independents, and some of the smaller nicer chains. Thirdly, the restaurants are separate units – this isn’t someone where one must carry a tray, it’s all about table service. We visited Tapas Revolution, run by Chef Omar Allibhoy, while it isn’t a one-off independent, the small chain of restaurants was founded and is creatively led by Omar still. There’s three branches in London, the new Birmingham branch, and another couple in the pipeline. During this opening period he’s often found in the open kitchen checking plates as they leave the pass – he’s easy to spot, Gordon Ramsay dubbed him the Antonio Banderas of cooking, and you may know Omar from one of his many TV and media appearances. 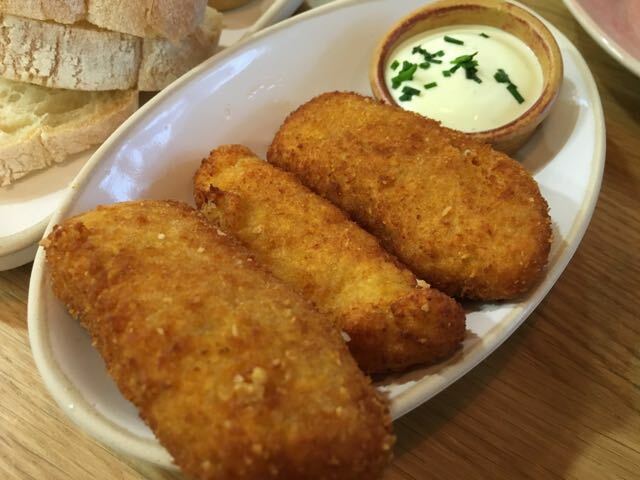 If you’re used to the “tapas” travesties presented to you by the likes of Las Iguanas, then as Miguel de Cervantes wrote “thou hast seen nothing yet”. 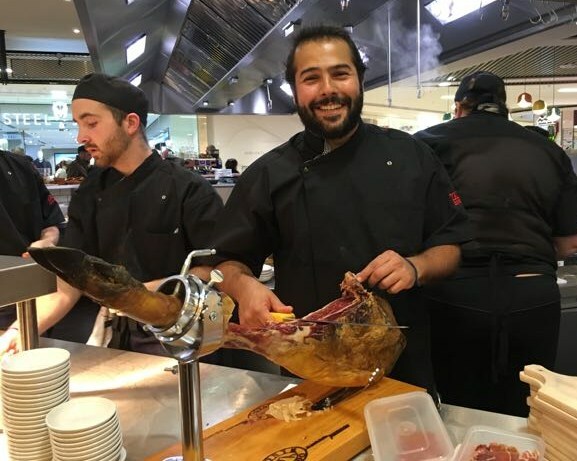 When Omar came to the UK to learn English and further his career he was surprised at the lack of good Spanish food on offer and set off on a road trip around the UK to promote his native fare, the start of his Tapas Revolution. Omar brings you classic dishes done well, in an environment that’s relaxed – perfect for dinner with friends and la sobramesa. We’re actually pretty well catered for in Brum for Spanish food, if you like Tapas then you must try Comida in Harborne which is one of my favourite places to be, and if you want a ridiculously cheap meal then Rico Libre offers good food in an unusual location (hint: taxi there if it’s after dark). We visited Tapas Revolution on the Friday night of its opening when Grand Central was heaving with commuters and shoppers. After a glass or two at the bar at Frizzenti, which specialises in on-tap Prosecco, we headed to Tapas Revolution. Despite it having a fair amount of seating, the layout makes dining quite cosy. We ordered pints of Estrella and a few plates of tapas. 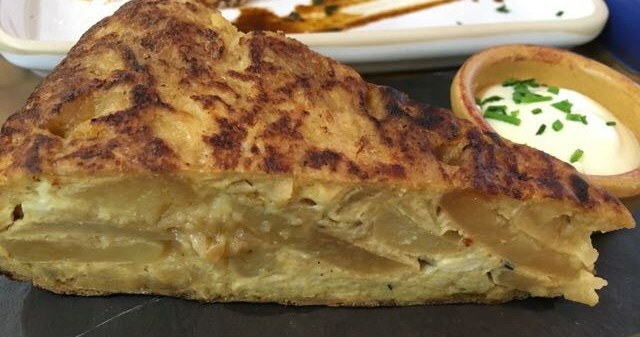 The Tortilla (why do people still call it “Spanish omelette”?) was good, and tasty with soft earthy potato. Soft and sweet calamares was encased in crisp golden batter and served with lemon and perfect with a punchy aioli. Ham croquettes were good, with oozing cheese and a smokey ham flavour. We also enjoyed the cod croquettes. The best dish for me was the cubes of pork belly that were perfumed with deep spices and herbs, very warming. Averagely the dishes are around £5 each, and a couple of meet dishes and a side each was plenty for us, so with a pint dinner will probably set you back about £20 a head. I’m relieved that Grand Central haven’t filled the place with McOutlets, and very pleased to find that the places I’ve already tried are good. This entry was posted in Area: Central Shopping, Area: Grand Central, Area: The Bullring, Cuisine: Spanish, Price: Average, Venue type: Restaurant and tagged Birmingham Restaurant, birmingham restaurant review, birmingham review, birmingham tapas, eating out in birmingham, Out In Birmingham, out in brum, OutInBrum, restaurant review, where to eat in birmingham, Where To Go In Birmingham, where to go out in birmingham. Bookmark the permalink. Went on Sunday and was a little disappointed :(. We only ordered fish dishes so I cant comment on what the meat tapas were like. Calamari was quite tasteless and probably frozen. Cod croquettes were quite tasty but not very generous portion for the price. The prawns tapas consisted of 5 rubbery overcooked prawns which were luke warm at best. The vegetable medley and patatas bravas were fine but nothing to shout about. Unfortunately there was a cold draft coming from above our heads and the already tepid food became cold very quickly. They also forgot to bring out our bread and water. Wouldn’t rush back – visit Rico Libre for a more authentic and enjoyable experience at reasonable prices. Thanks for your comment Louise. 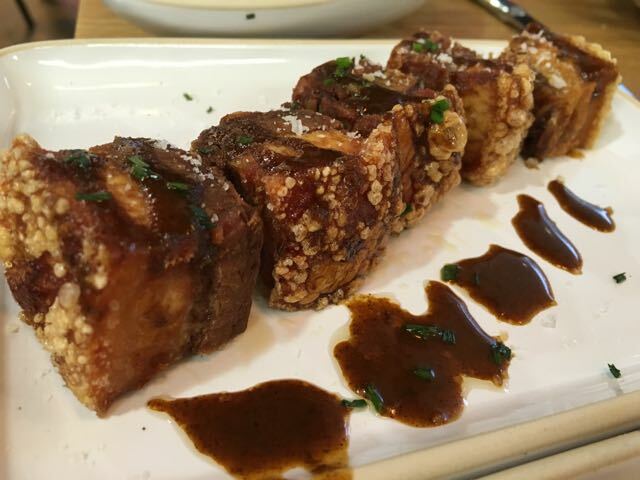 It’s a shame you didn’t have a good time at Tapas Revolution. I like Rico Libre too (https://outinbrum.com/rico-libre/), but Comida (https://outinbrum.com/Comida) is my absolute fav. Hopefully it was just a one-off and not the norm, most reviews we’ve heard from people have been favourable. Sutton Coldfield doesn’t seem to be an ‘area’ you recognise but you can get very good tapas at Don Diego. Thanks for your message. We do occasionally venture over to friends in Sutton, and previously they’ve raved about Don Diego though they don’t think it’s as good as it was before the owner managers moved to the city centre. We may well get there soon. We don’t hear great things about the food offerings in Sutton. We’ve had a nice evening at Eleon Greek, and I liked Moor Hall (https://outinbrum.com/2014/08/27/moor-hall/). Do let us know if you think there are other interesting places to try.